Rated PG for martial arts action and some mild rude humor. Of all the Dreamworks Animation franchise lead characters—not that there are many of them—Po, the often goofily hapless but ultimately mighty titular Kung Fu Panda voiced by Jack Black is the most unambiguously and unabashedly lovable. So, “Kung Fu Panda 3” has got that going for it right off the bat. The sunny metrics of the believe-in-yourself scenario the character offers—as appealing a combo as pandas and martial arts seem, they’re not exactly made for each other, which in each of the movies is exactly the point—are sufficiently strong that the films don’t need to truck in overt jokiness (as the “Shrek” pictures tend to, which I myself tend to find needy and irritating); they’re more about a genial, jovial, we’re-in-this-together attitude. Which is nice. 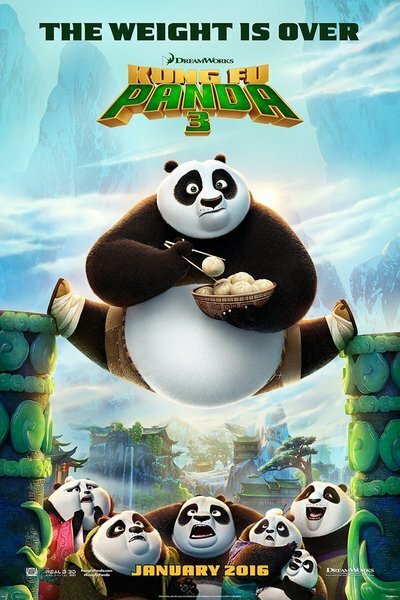 “Kung Fu Panda 3,” in spite of its abundant action—and for all the interspecies mashups, this is as much an action-adventure animated movie as it is a funny-animal animated movie—is a pretty relaxing experience for the adult viewer. The colors are beautiful, the design of the varied realms is ingenious and pleasing, the animation fluid and graceful. This panda doesn’t pander—there are scant, if any, nudging pop-culture references soliciting laughter from knowing grown-ups. “Be the best you you can be” is this movie’s message, and writers Jonathan Aibel & Glenn Berger, and directors Alessandro Carloni & Jennifer Yuh heed their own advice throughout this brisk romp. The movie opens with Po’s former master Oogway (Randall Duk-Kim) relaxing in the spirit realm, where he’s unfortunately confronted by bullish warrior Kai, who’s on a mission to rule all being and non-being by stealing the “chi” (life force) of a panoply of masters. His quest will end, he proclaims, when he bests the last earthly master of chi, who happens to be our hero Po. When we see him on Earth, Po is having trouble enough taking over the martial arts school from supposedly retiring master Shifu. After some martial-arts-equipment-destroying rounds with old pals Tigress, Mantis, Viper, and Monkey, Po has been pummeled back into the identity crisis that’s occasionally haunted the so-called Dragon Warrior throughout the series. The plot thickens when Po’s biological father (series adepts know that Po has been adopted by a crane) Li shows up to bring him back up to Secret Panda Village. Turns out Li’s on a mission that was shown to him in the form of a letter from the universe. None of this makes a whole lot of sense even in a world in which cranes adopt pandas and raise them as their own, and a lot of the plot points and catchphrases made me suspect the screenwriters just picked a lot of Sun Ra and Return to Forever song titles at random and dumped them into a Final Draft edit function. It kind of doesn’t matter though, because the movie moves inexorably to a climax wherein Po conquers his fears and misgivings, embraces the awesome, and with the help of friends and family—all being voiced with maximum likable sincerity by the best cast in the business (luminaries such as Dustin Hoffman, Angelina Jolie, Seth Rogen, Lucy Liu, Jackie Chan, and David Cross all return, while newbies include J.K. Simmons, Bryan Cranston, and Kate Hudson)—realizes his potential and saves the day. It’s as simple and as satisfying as that. And not just because pandas are critic-proof.